for any form of antisemitism"
"I want to reassure Scotland's Jewish communities that there is no place in Scotland for any form of antisemitism or religious hatred. We value our Jewish communities. We value the contribution that they make to Scotland, and that is a message that should go out strongly from this chamber. ... we have adopted the International Holocaust Remembrance Alliance's definition of antisemitism. That sends a strong message that we believe antisemitism to be entirely unacceptable in Scotland." "an apparent rise in antisemitism not just across the UK but further afield. We all have to be very vigilant about that, and my responsibility is to make sure that that is the case, particularly in Scotland. As I have said, I have had and will continue to have discussions with the Jewish community about exactly that. ... the Jewish community is a valuable and vital part of our society in Scotland, and if one member of that community feels unsafe here, all of us have a duty to respond to that and do everything possible to change it." She added, to applause from around the Parliament Chamber: "It is a responsibility that I take very seriously for the Jewish community and for any other minority community living in our diverse country, and I hope that all members will agree with and echo that." The report in the Herald on Sunday on 6th January 2019, which was subsequently picked up by a number of Jewish papers worldwide, concerned a meeting of the Cross Party group on Freedom of Religion and Belief that had been addressed by SCojeC Director Ephraim Borowski in February 2018 on the subject of antisemitism throughout the world, where he had made the point that Scotland has been, as one member of the Jewish Community put it in 2012 "a darn good place to be a Jew". 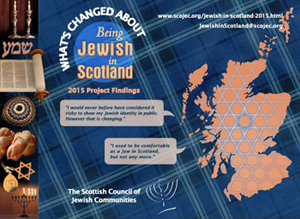 However, SCoJeC's research into What's Changed about Being Jewish in Scotland, funded by the Scottish Government in 2014, showed a different picture; we had been told by the same respondent that "I feel alienated, and no longer Scottish first then Jewish. I feel Jewish only," and several other participants made similar comments, saying that they try to hide overt signs of Jewishness. Ephraim commented: "It is unfortunate that this report gives the impression that Jewish people are sitting with their bags packed, ready to flee Scotland. Research consistently shows that levels of antisemitic incidents are lower, pro rata to the general population, than in the rest of the UK and most of Europe, but also that they are higher, relative to the size of the Community, than hate crimes against other religions in Scotland. We should not, therefore, be complacent, and every antisemitic outrage anywhere in the world, from Paris to Pittsburgh, inevitably leads people to ask themselves whether it could also happen here. 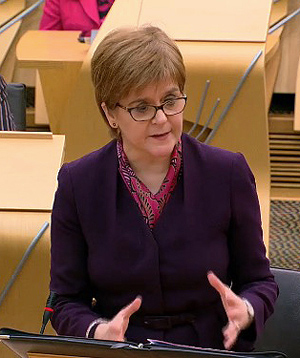 We therefore very much welcome the First Minister's remarks, and the support of her government for the Jewish Community, and we hope to embark shortly on further small-scale qualitative research to look at how experience and attitudes have changed since 2014."